This is the first time we meet Dorcas Trilling, sycophant and instructress at Reverend Trask’s sleepaway punishment school for inconvenient children, and within seconds, she’s working our last nerve. “You inspire me, Reverend Trask,” she says, simpering, and if there’s one thing that an audience can’t abide, it’s simperers. There are very few beloved henchmen in the canon of Western literature; basically, there’s Smithers in first place, and everyone else is in a thousand-way tie for last. Dorcas is tattling on Rachel, the former Collins family governess who’s working at the school for reasons that aren’t particularly relevant right now. The only thing that matters here is that Dorcas is instantly hateful. She’s fawning over her terrible boss, feeding his ego and making herself available for inappropriate contact. 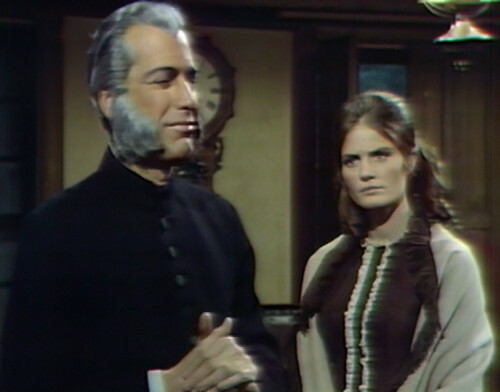 “How well you put it, Dorcas,” Reverend Trask says, and begins another round of shoulder-groping. You know, I wouldn’t have thought it possible, but this new Reverend Trask has become a charismatic cult leader, miles away from the original witch-hunting Trask’s nonstop solo anger machine. This descendant can do the crazy ranting of his namesake, but he can also downshift into this smarmy false-humility mode that seems to inspire women into begging for a hostile work environment. I never would have thought that Reverend Trask would be such a hit with the ladies. So let’s talk about redshirts, and their narrative uses. The term was coined by Star Trek fans, who noticed that the teams for dangerous planetside away missions always included major characters like Kirk, Spock and McCoy, along with a couple of one-shot nobodies on the security team. The major characters are planetside so they can be heroic adventurers, while the gentlemen in the red shirts are there to be killed by Stormtroopers and pod plants and Dikironium cloud creatures. Early deaths are an important part of an adventure story with life and death stakes, establishing that there’s a credible threat to the heroes even though everybody knows that there’s no way Spock is going to be taken down by a pod plant. Now, obviously, turning your soap opera into an adventure story is sheer madness — a soap opera is supposed to be a long-term enterprise where the audience invests in the characters’ development, while adventure stories are generally episodic and stocked with minor players who can be thrown into the firing line just in time for the main characters to notice the danger and avoid it. But Dark Shadows is far from the only soap that’s indulged in the dark business of ritualized redshirt slaughter. In the mid-2000s, lots of network soaps ran serial killer storylines where victims were picked off one by one until they reached a main character and stopped. My other favorite soap, One Life to Live, actually did three serial killer stories in the space of six years, despite the fact that they drag on endlessly and never result in the ratings bonanza that the producers seem to expect. Soap opera serial killer stories all follow the same basic pattern. 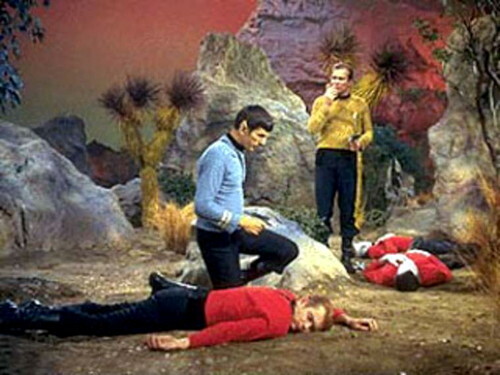 Victims 1 and 2 are the real day-player redshirts, who are essentially there to help the killer announce himself. The first one is just a mysterious death, so you also need a second one so that the police officers can realize there’s a pattern. The killer is essentially clearing his throat, and getting everyone’s attention. Victim 3 is a character created six weeks ago, just long enough to be recognizable when you pin her headshot to the wall. Victim 4 is a mid-tier character, who either dies or survives, depending on whether you were planning to cut them loose anyway. This may be someone in law enforcement who’s getting too close to the truth, if you have any. Then victim 5 is the top-tier character who everyone says is “the real target”; this is the one we’re supposed to worry about. 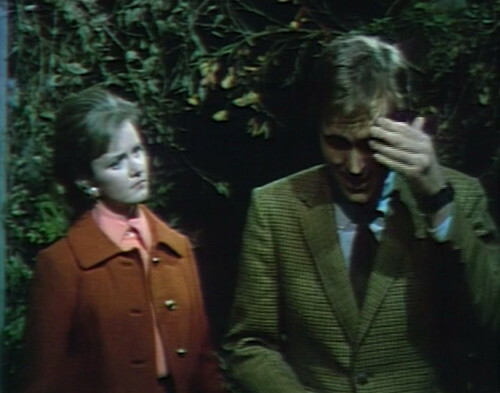 Dark Shadows has followed this pattern a couple times this year, starting with young werewolf Chris Jennings. His first two kills were day players — Mr. Wells the hotel clerk and a nameless barmaid, who didn’t even have any lines besides screaming as she was torn to pieces. For victim 3, Chris killed Carolyn’s friend Donna. In a modern soap, she would have been the six-week minor player, but Dark Shadows can’t afford to create short-term cannon fodder, so she was only there for a day. The funny thing about Donna is that they made a special effort to encourage us to dislike her before she was killed; she was annoying and aggressive with Chris, and as soon as her back was turned, Carolyn told everyone that they’re not even very good friends. Also, she had a red shirt on. Then victim 4 was Joe, who was severely wounded but not killed, and then we can start worrying about major characters like Carolyn. Quentin’s ghost started out with an attempted murder on a major character — Roger, who was tripped by a wire and fell down the stairs. This isn’t common practice, but he survived without serious injury, so I’ll allow it. Quentin’s next two victims were comedy psychic Madame Findley and comedy silversmith Ezra Braithwaite, who lasted just long enough for us to fall in love with them before they were killed. 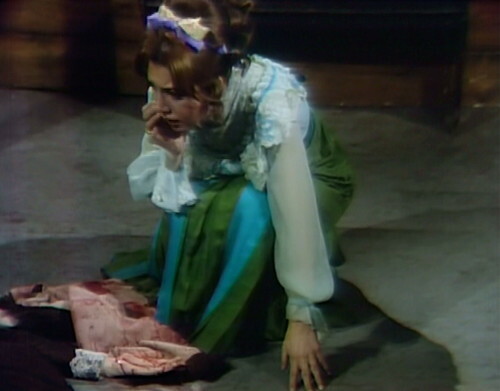 On Dark Shadows, you can always tell whether you’re supposed to like the monster by how appealing the early victims are. Chris was a romantic lead, so his first three kills were people we didn’t know or didn’t like. But Quentin’s ghost was a sinister spectre, so his redshirts were both lovable eccentrics. Even Barnabas took a couple practice swings in 1967 — biting Willie’s wrist, and draining some local cows — before settling on Maggie as his real target. And now, every time he goes into the past, he warms up with a couple dockside prostitutes before moving on to people that we care about. So now that we’ve got a new monster roaming the great estate of Collinwood, we need an expendable victim or two before we move on to the main event. Enter Dorcas Trilling, believer in righteous cruelty. Like the Ancient Ones in The Cabin in the Woods, the dark gods of serialized narrative demand a ritual sacrifice. 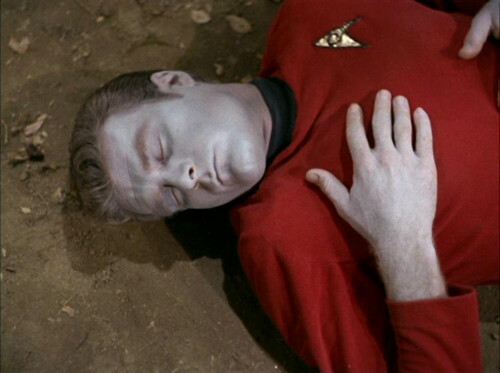 But that’s the thing about redshirts, I suppose; here today and gone tomorrow. Actually, gone about three-quarters of the way through today, if you want to get technical about it. It’s a shame that Dorcas is wearing brown, instead of the traditional color. Oh well, I guess it all ends up red anyhow. Tomorrow: The One Where Evan Ruins the Carpet. At the beginning of act 1, Rachel has a terrible time closing the front doors, and they swing open as soon as she walks away. The clock in Trask’s schoolroom is stuck at 10:00, from act 1 all the way through the end credits. It’s still 10:00 when we return to the school on Wednesday. Isn’t Beth fired? Judith dismissed her on Friday, and she was planning to leave with Quentin. But now Quentin’s not feeling well, and they all get distracted. She’s in every episode this week, and nobody mentions that she’s not working at Collinwood anymore. As far as I know, it’s never mentioned again. Smithers seems like more of a toadie than a henchman, unless The Simpsons has changed drastically in the years I’ve missed. Dorcas Trilling was played by Gail Strickland, a marvelous actress who made TV history in a short-lived ’80s drama called “Heartbeat.” She played a nurse practitioner with a girlfriend and the two were as affectionate as any other couple on prime time and it was treated as no big deal – truly surprising and heartening for its time. “Days of Our Lives” is currently in the midst of a wretched serial killer story. Victim No. 1 – a character whom everyone who had despised and had been on the show for six months. Victim No. 2 – a teenager who had been on the show for about 18 months. Victim No. 3 – the big hit – Will Horton – a legacy character who grew up on the show and was related to just about every other major character. Will also came out as gay a few years ago, and his death is widely seen as the show de-gaying itself to draw more viewers. Will was killed while waiting for the cable guy, knocked into a fridge and strangled with a necktie. Seriously. Oh, that’s horrible. I didn’t know they killed Will. Also, Gail Strickland was in an episode of Star Trek Deep Space Nine. She wasn’t wearing a red shirt but she was nasty and annoying – kind of like Dorcas. I watched Days of Our Lives’ during the first serial killer case ‘The Salem Strangler’ and it was quite a novel story at the time – remember when audiences thought that beloved Marlena Evans was a victim, and it turned out to be her twin sister Samantha Evans? 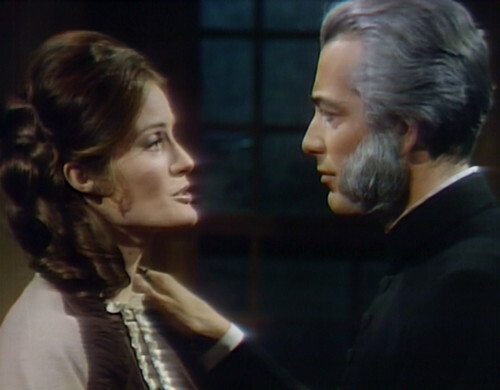 How convenient that Diedre Hall really had a twin that was playing her twin on the show at the time..
Also one of the best day player characters ‘strangled’ by dear Barnabas in 1795 was Suki Forbes, who I could have seen becoming a major presence on the show had she been given a chance. Of course we have the geographical conundrum. How far is Trask’s school from Collinwood? How come Quentin’s victim is a couple miles away, and no one nearer is in danger? After Laura burned the school down it relocated to somewhere on the Collinwood grounds I believe. So probably not that far a jaunt for Quentin. The school is in the house by the sea on the estate. Am I the only one who thinks that “Dorcas” is just the absolute funniest sounding name for a character? Particularly one you plan on getting rid of in short order–and especially for an audience of youngsters who are running home from school, where they have passed their day amusing themselves by ridiculing the funnier sounding names of their more unfortunate classmates. In the pilot for Falcon Crest (with Clu Gulager playing Chase), Angela’s daughter Julia is named Dorcas. At some point after the next full moon, Beth says to Judith, “I know my two weeks are almost up…” Judith dismissed Beth at the last full moon, (and gave her two weeks notice which was EXCEPTIONALLY considerate given that most servants I believe were given their walking papers and told to get out immediately) so it’s been four weeks and not two. Oh, I thought she was supposed to leave immediately. When Judith fired her, she went back to her room and started making escape plans with Quentin. I think she was supposed to leave immediately as well and that two weeks line was thrown in a few episodes later to explain why she’s still there. After that, I don’t think they ever bring it up again. Judith gave Beth two weeks’ severance pay on the day she dismissed her, not two weeks’ notice. Gail Strickland is the only person I know of to appear on both Dark Shadows, and Seinfeld. On Seinfeld, she played graceful Jocelyn Landis from Doubleday. She borrows Mr Pitt’s tennis racquet from Eliane, only to tear her humeral epicondylitis. Never play tennis with a werewolf. Pierrino Mascarino and Paul Michael are 2 others who appeared on both Seinfeld and DS. I believe Montgomery Scott wore red. Oh, Danny, what a great long setup for that last joke…..
Also, Dorkus was our teenage slang for d–head. Jerry Lacy’s eyes are full of laughter in this episode – like he was doing a SNL skit instead of a DS episode. I’ve often wondered how often the actors nearly burst out laughing in some particularly funny scenes. Hell, I’m laughing – how could they not be tickled, too? Beth just openly staying on at Collinwood as Quentin’s mistress after she’s fired is one of my favorite parts of Dark Shadows. Well, somebody’s gotta feed those babies. I knew a Dorcas who did really did look like a Dorcas, Miss Prim and Proper, that is, until she opened her mouth, and oh my, she had a wicked bitchy sense of humor and was a lot of fun to hang out with. Her husband was transferred to Utah, and I imagine she’s upsetting all the Mormons now with her potty mouth and bad attitude. 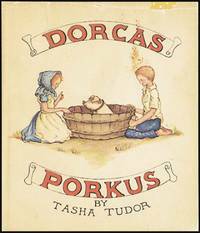 The only Dorcas I know of is actually the lead character in a UK light Victorian rural drama “Lark Rise to Candlefird”. A postmistress played by Julia Sawalha. On other matters. Anyone else note the wonderful meta-comment by Beth that Judith doesn’t like to involve the police “They always get in the way”! No comments on the premiere of David Selby’s bare chest?